In being the keeper of a pie blog, I've come to be a recipient of a lot of harebrained pie ideas. Last year around this time, Brent came to me with one. Buffalo. Chicken. Fried. Pies. 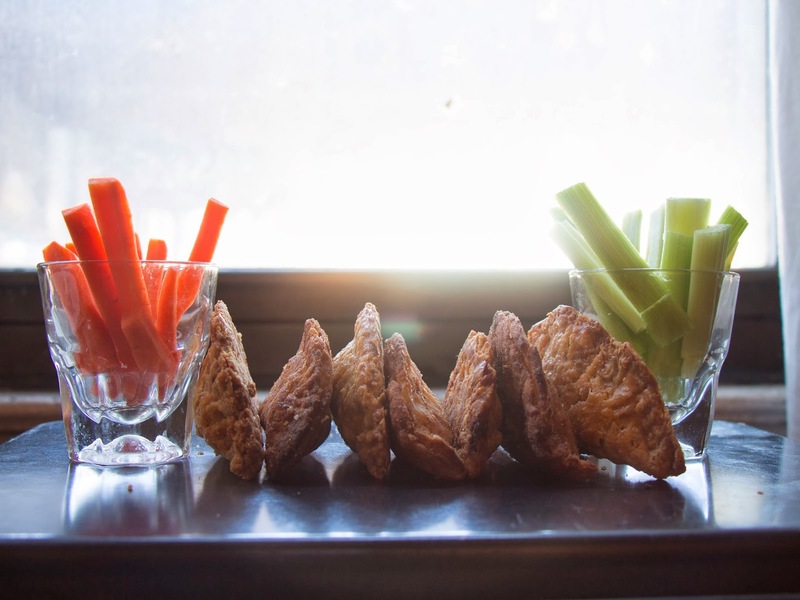 His vision was for a self-contained Super Bowl snack that captured the flavor of chicken wings, complete with hot sauce, carrots, celery, and blue cheese dressing, but was encapsulated in a pie crust and able to be held in the hand while watching the game (or Beyonce as the case may be). I was skeptical but willing to give it a try. We were invited to a Super Bowl party by our friend Lars, who also happens to be an organic chicken farmer, and when we arrived on Sunday evening with a grocery bag full of ingredients and cooking oil, Lars had the chicken ready to go--already cooked and marinated in hot wing sauce. The result was obnoxiously good. The frying warmed all of the ingredients, melting the blue cheese while keeping the carrots and celery still crispy, as in a buffalo wing chaser. I've apparently haven't really stopped thinking about them since, because this summer, I mentioned it to my friend, pocket food afficianado and video maven Mackenzie Smith, who I met at the LongHouse Scholars Program. She brought them up again a few weeks ago, and last week I traveled to Brooklyn to whip up a batch while Mack filmed me (and my sous chef Justin). She put together this very fun little video on the new favorite snack! Kick it off. 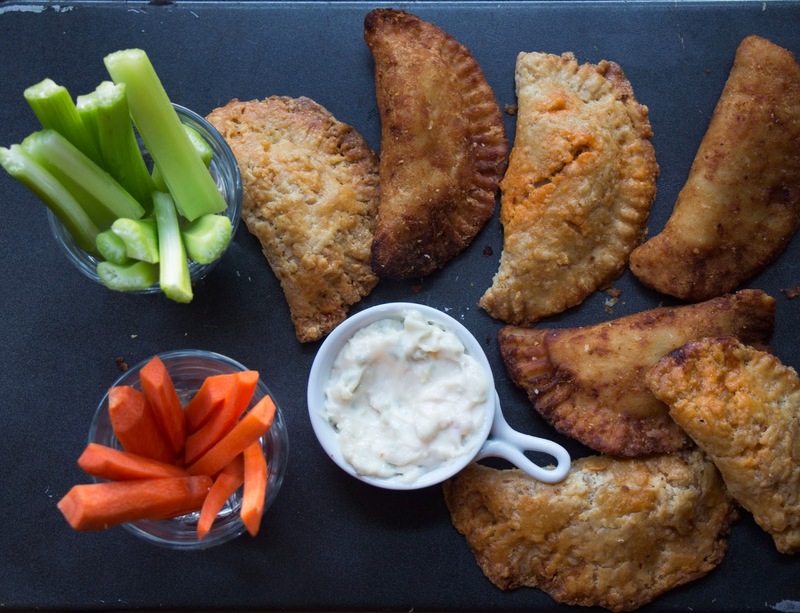 Buffalo Chicken FRIED Pies from Mackenzie Smith on Vimeo. 1. Prepare Nothing in the House pie crust as per the directions. Refrigerate while you prepare the chicken and other filling ingredients. 2. Prepare the chicken. Preheat oven to 350 degrees F. In a small baking dish, spread a thin layer of flour and season with salt and pepper. Coat chicken on all sides with the flour mixture. In a skillet, brown chicken with oil over medium heat. Transfer to a heavy baking dish and cover with hot sauce. Bake for 35-40 minutes until chicken is cooked through. Let cool completely before removing skin and shredding chicken with a fork. Set aside. 2. Once your filling is ready and pie dough has chilled for at least 1 hour, remove from fridge and roll out onto a lightly dusted surface about 1/8 inch thick. Using a large biscuit cutter or top of a large mug or jar, cut circles out of the dough (you can make them as large or small as you like, just remember that the smaller the pie the less filling can fit inside). 3. Mound chicken, vegetables, and blue cheese in the center of each circle--you'll want to aim for about 2 Tablespoons of filling total, but depending on how big your dough circles are you can use more or less. Remember it is better to under-stuff than over-stuff. 4. Moisten the edge of the pastry circle with your finger, then fold over the dough to form a half-moon shape. Press the edges together and flute with a fork to seal completely. Place the formed pies on a parchment paper covered baking dish and place in the freezer, at least 20 minutes and up to an hour. 5. Meanwhile, heat the oil (If you prefer to bake your pies, you can do so in an oven set at 375 degrees F for about 15-25 minutes). 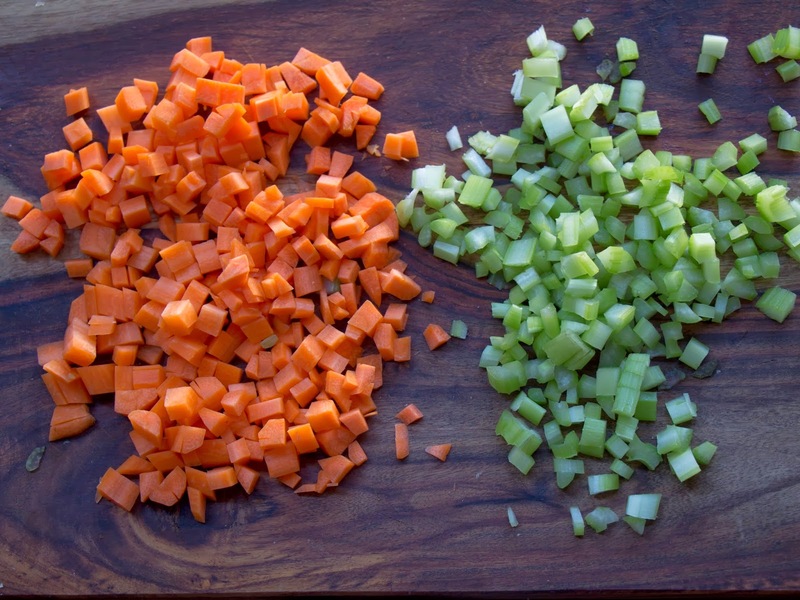 Pour at least 2 cups of canola oil (or 4 inches deep) into a deep and heavy saucepan. Insert a candy thermometer into the oil. Slowly heat on medium-low until the temperature reads 350 degrees F.
6. When the oil temperature reaches 350 degrees, gently lower one pie at a time into the heated oil and cook until golden brown (about 2 minutes per side). Using a slotted spatula, transfer to a paper-towel lined plate. Repeat with the remaining pies. 7. Let pies cool slightly before serving, but they are best eaten when fresh and warm! 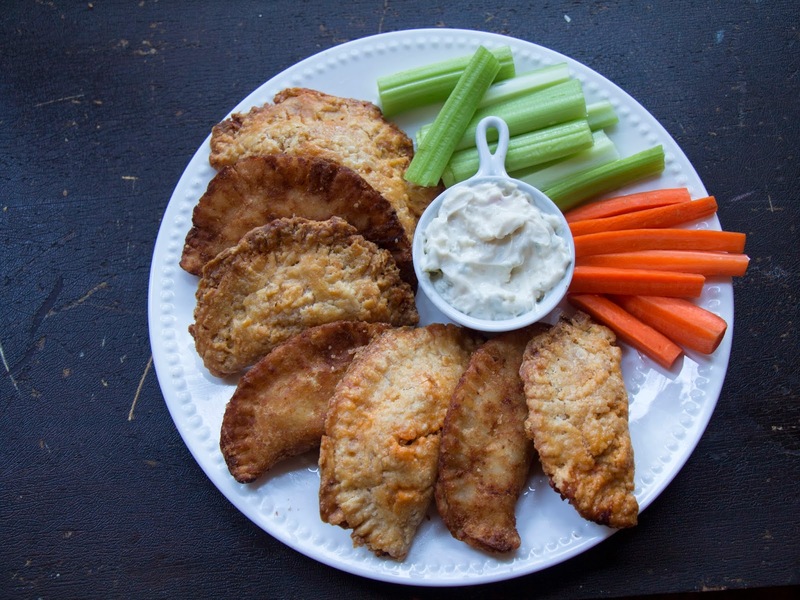 Dip them in your favorite buffalo chicken wing sauce or blue cheese dressing and go team! Big thanks to Mackenzie Smith for lending her many talents and vision to produce this video and photos. Mack is a Brooklyn-based multi-media producer and heritage cookbook editor and you can find more of her work here. Look out for a new food video project from her coming soon. 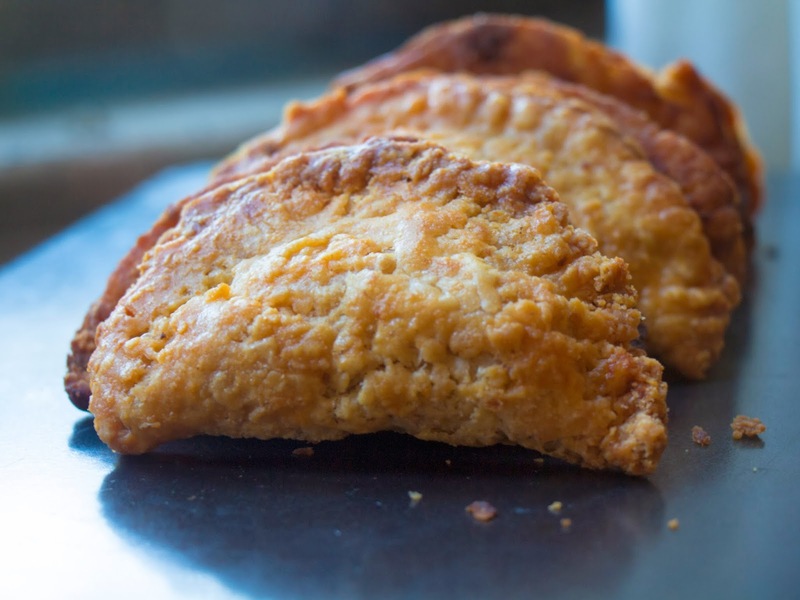 Labels: buffalo chicken fried pies, Fried pie, meat pie, New York, savory pie, Super Bowl food, videos, Washington D.C.
this is SO great! loved the video; see also: MOUTHWATERING.